The origins of Linda Reeves' fervor for embroidery are vague but she treasures a bag fashioned from coarse burlap and embroidered with knitting yarn which earned her a Girl Scout Merit Badge. Linda's mother, Irene, a uniquely gifted seamstress, was an early inspiration and guiding light. With her unerring eye for design composition, she taught Linda to discern the less obvious, but more creative possibilities, in combining disparate elements to form an artistic whole. Being encouraged to venture beyond written instructions and learning that self expression evolves from experimentation, Linda gained the self-assurance to trust her own instincts. Linda's exclusive pattern, designed for our web visitors is entitled "Sweet Spring," and includes a companion piece, a scissors keeper. Linda creates these complementary accessories to make use of the "kibbles" of leftover threads and linen. Perhaps the only connection between Linda's previous career and her current one is an interest in botany. She earned a BA and a MS in Biology, with emphasis on Marine Botany and a Ph.D. in Botany, with emphasis on Cell Biology. A post doctoral fellowship in Microbiology followed. From there, she forsook academia for the "real world," working in the environmental field. By training, Linda is a chemist. Her career advanced to a position as the national director of laboratory quality assurance for an environmental analysis and consulting firm. This job kept her on the road and to both pass the time and save her sanity, she applied herself to needlework en route. Since airplanes are not exactly a "stitcher's paradise," Linda refined her projects to those which did not require the close scrutiny of a chart, leading to her preference for band samplers. As her traveling and stitching progressed, Linda realized that she was changing the elements of the design to her own taste more often than not. Thus up in "the friendly skies" was a designing talent honed. Many changes followed her marriage to Mark, a fellow scientist, and the subsequent birth of their son, David in 1991.Though she had been extremely career oriented, intending to take a temporary leave, this soon changed. The drive to compete in a fast-paced, high stress world evaporated as home and family became her overriding priorities. Though often physically exhausted, motherhood gave her a new outlook on life and a resurgence of creative energy. Between infrequent naps and frequent diaper changes, Linda sketched ideas for needlework projects. These projects began with an existing design as a starting point and then improvising from there. Ever the observant scientist, Mark noticed the constant alterations she was making. Realizing that what she was actually doing by changing the elements of the pattern, was designing, Mark urged her to attempt her own from scratch! Initially, Linda shrugged off this comment, but the seed had been planted and eventually sprouted - big time! The first "seedling" to grow and bloom was the "Pink Dogwood Band Sampler." As a career woman Linda and other "needlework groupies" regularly congregated at the local shop. One day, just as she was getting her feet wet as a designer, the owner literally grabbed Linda as she walked in the door. As the proprietress gushed about the arrival of an exciting new find at market, she unpacked her booty: the Caron Collection Waterlilies-overdyed silks. Linda had never seen anything like them and exclaims: "That sort of pushed me over the edge!" Having not a clue as to how or when she would use them, she just could not resist their allure. Another inducement was a perfect confluence of factors in the early `90's which made it an ideal time to begin a design career. The needlework market was exploding in a riot of color and texture with the introduction of colored linens, textured fibers and countless new embellishments. Everywhere Linda turned, there was a preponderance of novelty supplies initiating inspiration. Mark again spurred Linda along by suggesting that she exhibit at the Charlotte Show. The seed had grown into a blossoming tree which was about to branch out. Linda named her new company "La Broderie." Though eminently appropriate as it means "embroidery" in French, there was a more nostalgic reason behind it. While on honeymoon in Canada, Mark and Linda visited the "Old City"in Quebec. As passionate bibliophiles, they wandered into a bookstore and Linda discovered a charming old volume called La Broderie, a perfect addition to her needlework library. She recalled that serendipitous find and it seemed especially suited to her business given the way it had evolved so naturally yet unexpectedly. 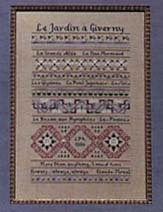 Seven years later "La Broderie" offers forty leaflet designs and thirteen designs commissioned by a variety of needlework publications. Lacking formal training has never hampered Linda's development as a designer, though her methods may be rather unorthodox. Her primary inspiration is the written word: poetry and quotations. Linda starts by charting on graph paper with pencil. After she gets a rough design going, the stitches, motifs and overall pattern flow from there. These elements will then evoke the "color mood" appropriate to the sentiment. Most often, Linda employs Wildflowers threads in her work because of their compatibility with flower thread. Beads, charms, semi-precious stones, gems, sculpted attachments and other embellishment are where Linda "really goes all out," leading her to make a very apt comparison: "Incorporating these fabulous attachments in your design, is like being able to put fine jewelry on with your best outfit." Stitching her models is part of Linda's design strategy, intuitively changing elements as she works on it. What she begins with is sometimes so far afield of the outcome that she jokes: "Darwin would have loved me." Moreover she believes that a designer should see her work through from its first stitch to the very end, so that she will be aware of potential questions or other snags other stitchers may have with it. Although Linda designs by employing what she refers to as a very "loose" method, stitchers find her style very distinctive, describing it as fresh and pristine. A clue to her work is provided by a signature alphabet which Linda developed and consistently uses. She calls her designs "contemporary samplers,": samplers "where you can break all the rules." Using as many different stitches as can be worked complementarily into the pattern, Linda further refines her designs by altering, stretching, adding steps and combining the stitches in novel fashions. Needleworkers eagerly respond to these quirks in her work. Linda has been especially successful with smaller pieces such as her "Sampler of the Month Birthstone Series," which make endearing, personalized birthday gifts, as each contains an appropriate semi-precious stone. When working in a diminutive scale, Linda applies the same aesthetic considerations as in larger designs, striving to integrate an element of artistic challenge into each. 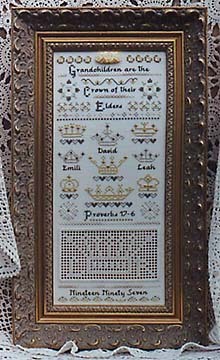 Recently a new facet has been added: drawn thread work which is integrated into the sampler as a separate panel. This accent highlights either a motif used in the design or relevant date. 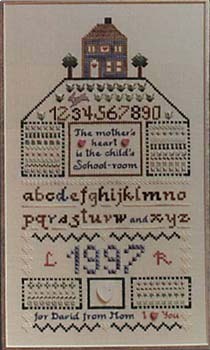 The uncommon, yet flattering, combination of these techniques creates an aura of elegance, gracing the more traditional homespun look of the sampler. Having forsaken the fast lane of her previous career, Linda currently works part time at her son's school. One still find her most evenings at the kitchen table, pencil in hand, sketching out a new idea against the strains of classic rock, ever a child of the `70's. Her designing profession melds perfectly with her simple, quiet lifestyle. "I do not live a designer life," she asserts. Her family is endlessly supportive, assuring that their home and her work are harmonious and satisfying. When she announces: "Life is good," one readily recognizes and appreciates this sense of contentment in her work. It all sounds like a designer's life "to die for!"